G-COAT™ (Polyether Ketone) 600 Series electrostatic coating powder are available where higher thickness coatings are required, where difficult geometries must be coated, and in instances where enhanced properties such as release are required. G-COAT™ 600 powder coatings can be used in traditional electrostatic coating equipment either in manual or automatic powder booths using a negative corona charges. 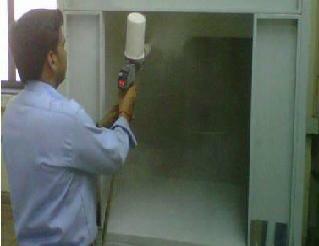 The gun, powder transforming lines and the fluidizing unit should be completely covered and cleaned to remove all vestiges of other powder prior to charging the system with G-COAT™ Coatings otherwise, coating defects such as black specks, pinholes, and craters will be evident in the finished coating surface. The fluidizing unit should be capable of providing a steady stream of powder to the gun without slugging. The compressed air supply to the unit should be filtered and dried to remove any contaminants from the compressor.